"The Road in Los Robles still very bad, but some big vehicles can penetrate. People in Los Robles have lost many belonging, they lost animals, plantation and the homes are deteriotated. Today we were able to [enter into] Los Robles and we brought some food for them. In Algodon the water has decrease meaningfully, but still most of the people are in the churches in Barahona. Altagracia and Don Bosco were the least affected,but still many families need to repair their ceilings and lost belonging. 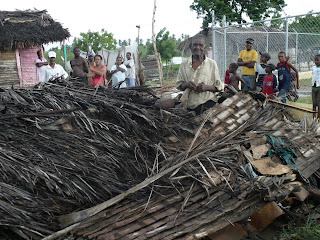 La Hoya, Hato Nuevo and Pescaderia small places between Algodon and Barahona, are in terrible conditions. We have news of hope for the containers next week." Pray with us for safe transport of the two remaining supply containers, filled with food, clothing and supplies to rebuild the schools.